'Gnarly' reception, by Herbie Fletcher, The Modern, Honolulu. Sunrise Pool, The Modern, Honolulu. 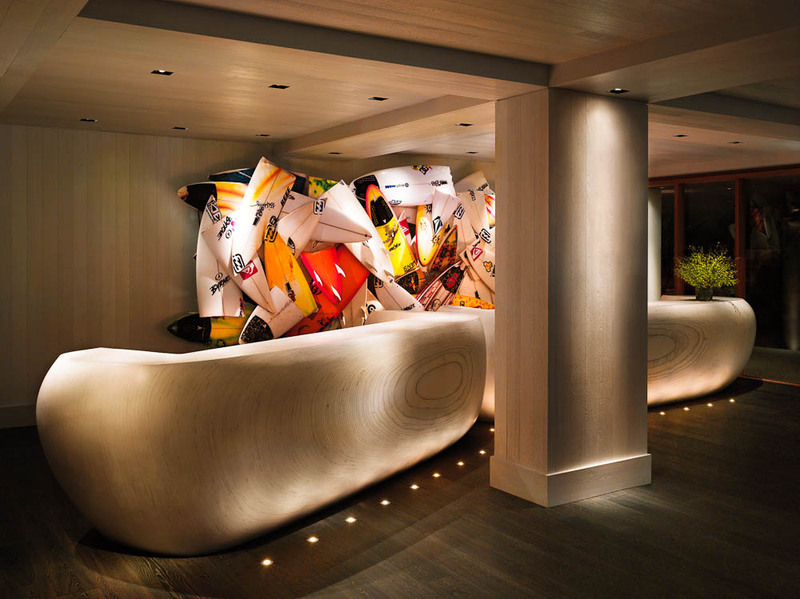 Lobby Bar, The Modern, Honolulu. Celebrity chefs and guests, secret bars and a happy hour till 2am, this is one of Honolulu’s hippest hotel, writes Chanel Gallen. I don’t usually lurk around bookshelves; suspiciously poking at ornaments, eyeing off the perimeter for any sign of entry, but minutes after arriving at The Modern Honolulu I was doing just that. Rumour was, at 6pm each evening the bookcase in the hotel lobby swung open to reveal a secret bar. Unfortunately 6pm was still a couple of hours away and, at that moment, the bookshelf looked like any ordinary book-bearing shelf. Although The Modern sits on the fringe of Oahu’s famous Waikiki beach, it is far from the gaudy floral assault you might expect of Hawaiian accommodation. There are no leis on arrival nor will you be ambushed by a swarm of damp floral shirts attempting to strap a coconut bra on your chest. 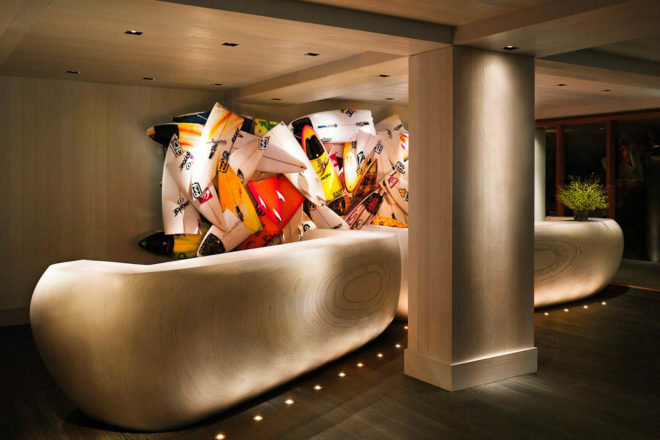 Instead behind the reception desk you’re greeted with a Herbie Fletcher installation; a colourful mix of broken surfboards fixed together and signed by their famous riders. The hotel has not one, but two pools to lounge by. The Sunrise Pool is deservedly the favourite with guests. The downside on busier days over the weekend is you need to get up at daybreak to snag a position in the sun. And to be oh-so hip, day beds not only surround the pool, but are in the pool; need to cool down, simply roll off. The Sunset Pool is the adult’s only scallywag-free oasis, which is kind of comical considering it is only a foot deep. It’s worth a chill-out in a hammock surrounded by sand and palm trees with a sparkling view over the marina. Start with happy hour at 4pm (must have – coconut mojito) and don’t move. When the sun goes down, the Sunset Pool is the venue for Moonlight Cinema nights and Friday night fireworks. The design aesthetic has won the hotel a swag of awards (Best Overall Interior Design and Best Lobby for 150+ Rooms at the EnRoute Hotel 2011 Design Awards). Around every corner you’re greeted with eye candy. Ferns hang from pots sliced in half and fixed to walls along the passageway, cushions pop with blue, pink and gold on outdoor lounges and when evening sets in, candles are lit and fairy lights twinkle in the trees. The resort’s palette is present from rooms to staff uniforms; a cool white, stone and grey. Ocean View rooms are Instagram-heaven views over the Ala Wai yacht harbor and Pacific. You’re also only a five-minute walk from the Ala Moana shopping centre and 10 minutes from the heart of Waikiki. At the spa you can tailor massages to oils and scents you like; lavender, lemongrass and even good old Aussie eucalyptus is on the menu. And the food; oh the food. Iron Chef Masaharu Morimoto’s Waikiki restaurant is on The Modern’s doorstep. On the menu you have clam miso soup, braised 10-hour pork belly and fresh tofu prepared at your table. Wash it down with a dangerously slurpable Coco Fraiche cocktail while doing some sneaky star spotting (Barack Obama is known to dine at Morimoto when he is ‘home’). Sauntering into reception at 6:05pm I do a double take. The rumours are true. The bookshelf has swung 90 degrees to reveal a dimly lit room nicknamed ‘The Study’. The signature cocktail menu is text-book thick and the drinks impressive. The Study’s reverse happy hour (10pm-2am) makes it the perfect place for a quiet nightcap. However, if you want a change of pace, head to celebrity/socialite hot spot Addiction Nightclub that is also part of The Modern set up. Take a detox package: VIP table service and a bottle of Grey Goose vodka at the club followed by a detox massage at the spa the next day. Perfect hangover cure. Keep an eye on the hotels website to snap up accommodation packages, credit to use on hotel services of breakfast included. The pool area is 24 hours so don’t stress if you enjoy one to many Mai Tai at happy hour and relax into the evening. Head down to the foyer each morning for a complimentary coffee and tea service. Don’t miss out on the refreshing tubs of mango or lemon sorbet staff hand out around the pool during the day.